A wine cooler could be a delightful gift option for the wine lover in your life. Whether your friend is just beginning to explore the world of wines, is replacing an outdated cooler, or needs expansion room to accommodate a growing collection, a dedicated cooling unit protects the owner’s investment as it guards and enhances flavor. When it comes to choosing the best wine cooler for someone else, it may prove to be a bit complicated. There are many different types of wine fridges available for you to choose from, and they all vary considerably in size, quality, price and ideal environment. 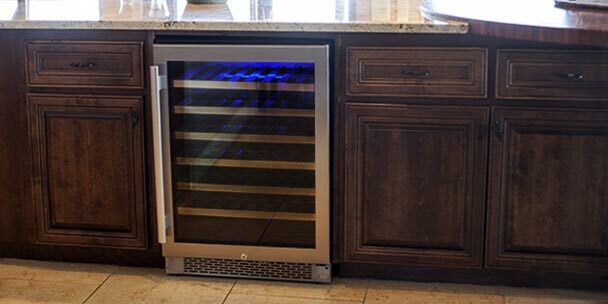 A wine cooler demonstrates the value of proper storage when it comes to a growing wine collection. The kitchen fridge may be an easy place to keep a few bottles, but there is a potential negative impact to storing your wine using your standard home fridge. First of all, temperatures for food storage are colder than the optimal range for wine, preventing development of full flavor. Wine coolers operate at slightly warmer temperatures that not only provide excellent short-term storage, but allow the wine to age appropriately for the length of its time in the cooler. Another issue is the need to keep temperature constant. Each time someone raids the kitchen refrigerator, warm air invades the storage space and disrupts the consistency of the surroundings. Frequent fluctuations disturb the quality of the wine’s flavor, and too much heat can cause premature aging. Neighboring foods and harsh lights can also affect the taste of the wine, altering the valuable characteristics of an expensive purchase. There are also physical dangers behind kitchen refrigerator storage. Vibrations disturb the natural sediment that plays a part in the aging process. Wine should be stored on its side, the cork naturally kept moist by the contents. When the bottle is stored in an upright position, the cork is in danger of drying out and shrinking, exposing the contents to spoilage. A food fridge that is in heavy use has little room to accommodate glass bottles unless they are standing, preferably caged in a door shelf to avoid being knocked over in a frenzied quest for the mustard or cheese. 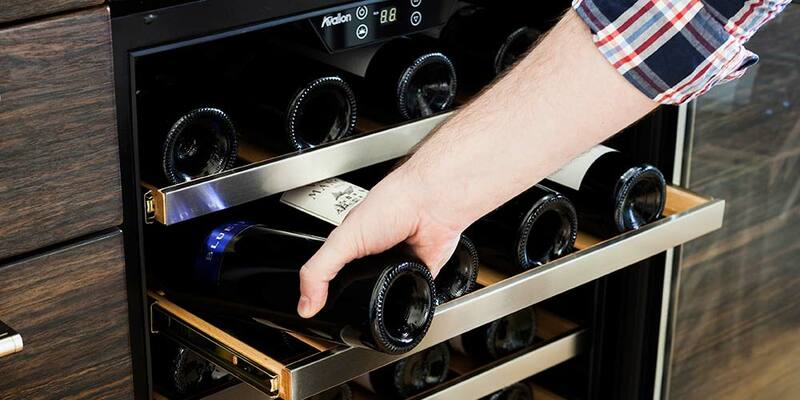 In contrast, a wine cooler maintains consistent temperatures that can be set electronically to achieve the optimal range. Vibrations are drastically reduced or eliminated, and exterior air invades only when a bottle of wine is retrieved. Tinted glass provides protection from light, and racks allow convenient access while supplying plentiful storage. Size, determined by the number of bottles being stored. Number of controls, depending upon preference for either red or white wine or an affinity for both types. Placement, dictating dimensional and ventilation requirements. Personal taste, as reflected in style considerations. What Size Unit Is Needed? Someone just venturing forth into the world of fine wines may not need much storage, but you would want to be sure to allow some room for growth. A little bit of extra room is a good idea at any stage to avoid insufficient space down the road. The entertainer will need to be prepared with more spirits than the person who just enjoys relaxing with a glass of wine in the evening. Coolers come with capacities ranging from six to hundreds of bottles to provide choices that fit both space and palatal desires. 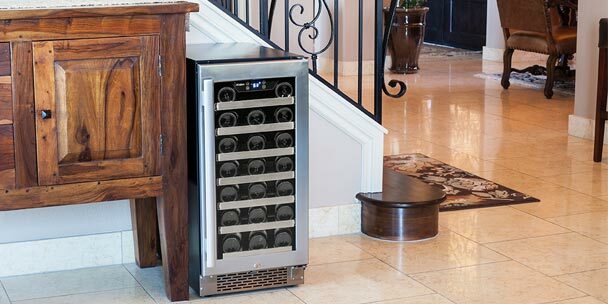 This 18 bottle cooler has two zones to keep your whites and reds at different temperatures, while the EdgeStar 166 Bottle Wine Cooler houses an expansive collection. Should You Choose Single or Dual Control? There are many considerations in selecting single or dual control. Red and white wines have different temperature needs. Trying to find a setting somewhere in the middle could potentially impact achieving optimal taste for your bottle. The person who drinks only one type of wine might find single control to be ideal. However, a connoisseur of both whites and reds would probably prefer to store them at different temperatures to enhance enjoyment of the entire collection. With dual control models, selections are available with a single door that opens to both areas simultaneously or separate doors for each chamber. 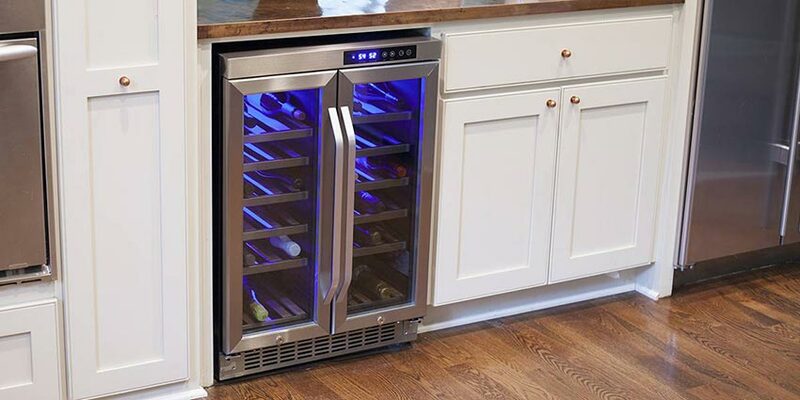 French doors like this Built-In Dual Zone Wine Cooler can afford more protection for the wine lover’s collection by leaving one section undisturbed. Temperatures can remain constant for the reds while the perfect white wine is selected for dinner. Where Will the Unit Be Placed? 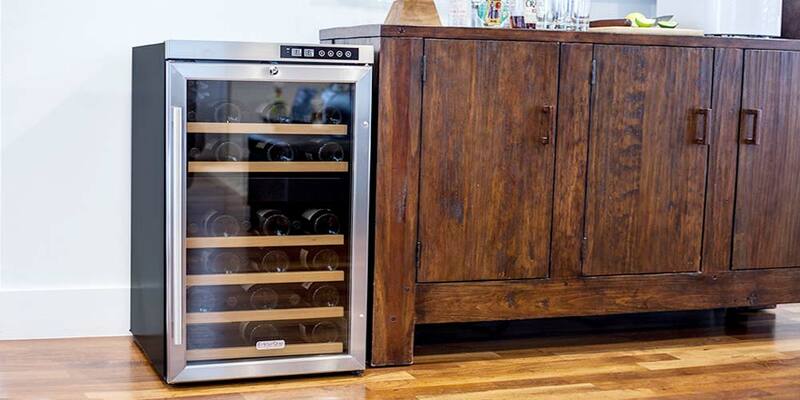 After determining the storage capacity your wine-loving friend or family member needs, the next consideration is where the cooler will be placed in the home. Units come in stand-alone or under-cabinet styles, tall and slender for narrow places or low and wide for limited vertical space. Some smaller units will even fit on the countertop. If mobility is needed for changes in living quarters, a stand-alone model would be the best choice. You might want to purchase a cooler with a reversible door so that no matter where the wine is stored, access is not impaired. If there is any possibility of a stand-alone unit being placed under a cabinet, be sure to purchase a cooler with front ventilation. Most portable wine coolers vent from the sides and back, requiring clearance for the unit to work properly. If the fit is too tight heat can build up, compromising not just the quality of wine but potentially causing damage to the appliance. Front ventilation allows placement flush against the walls and snug under the countertop. The clean lines of stainless steel and tinted glass speak of modern efficiency with classic purpose. Wine rests calmly at optimal temperature, ready for an evening’s refreshment or sharing with visitors. If a more traditional wood finish would better enhance your friend’s décor, you can select the desired surface with the appropriate capacity and proportions. Individual taste is reflected not only in the choice of contents, but in the stylish cabinet that protects each treasured bottle. By keeping these important areas of consideration in mind, you should be able to select the perfect gift that will provide the wine lover in your life with many years of enjoyment. You may even benefit from your own generosity as your friend offers you a taste of properly-stored wine. I have a Haier that recently malfunctioned and froze a number of bottles resulting corks being popped. Hair was totally unhelpful, but one issue was raised about where the unit was located. The unit had functioned ok for over ten years, and it was placed in the basement which in the winter stays from 50 to 60 degrees. The freeze up occurred in early April when the temperature was a little warmer. Anyway, the person I spoke with said the unit should not be in a location where the temperature could be in the 50’s. Nothing in ay of the articles speaker to this issue. I’m looking to replace the unit with a single temperature model 30 to 50 bottle size and free standing. What about the location and any recommendations.